New Bern and Craven County offer a variety of cultural, educational and historical attractions, from a magnificent palace, to museums and even beautiful gardens. There is something for everyone to enjoy! 610 Pollock Street, New Bern, North Carolina (252) 514-4900. Known in colonial times as one of the most beautiful public buildings in America, the elegant Georgian-style mansion served as both home of Royal Governor William Tryon and the capital of the Colony of North Carolina. Restored to its 18th-century glory, Tryon Palace is furnished with an outstanding collection of antiques and art. The grounds are devoted to extensive gardens ranging from English formal gardens to a kitchen garden to wilderness garden areas. Tryon Palace includes four contrasting homes of exceptional beauty. Interpreters in period costumes conduct tours of Tryon Palace all year. An audiovisual orientation program and crafts demonstration, including cooking in the Tryon Palace kitchen, basket weaving and blacksmithing, are offered daily on the Tryon Palace grounds. 256 Middle Street, New Bern, North Carolina (252) 636-5898. On this spot in his pharmacy, Caleb Bradham invented “Brad’s Drink,” which later he patented as Pepsi Cola. Today you can relax and enjoy a Pepsi Cola at the recreated soda fountain and purchase a souvenir. 317 Middle Street, New Bern, North Carolina (252) 638-2577. This former bank building (c.1913), headquarters of the Craven Arts Council and Gallery, is both a cultural and an architectural treat. 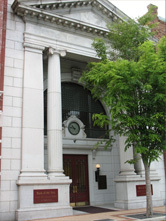 The Bank of the Arts changes exhibits of various media such as painting, sculpture, photography, pottery, and fiber art by artists of the southeastern United States are provided free of charge in the Bank of the Arts gallery area. (Trolley Tour) - 333 Middle Street, New Bern, North Carolina (252) 637-7316. Discover three centuries of history and architectural beauty in a 90-minute trolley car tour of historic New Bern. Professional guides will recount the fascinating details of this former royal capital of North Carolina. 183 Woodrow McCoy Road, Cove City, (252) 514-9494. Enjoy A Day at the Farm where you’ll see historic dairy barns, milking equipment and period antiques. Other areas of interest include a pumpkin patch, peanut patch, fish and duck pond, farm animals, a swinging playground, hayrides and much more! Corner of New Street and Hancock Street, New Bern, North Carolina 514-4951. The New Bern Academy Museum building originally served as a school house for boys and girls, then served as a hospital in the Civil War and in 1881 became part of the New Bern Graded School System. Today there are four permanent exhibits: Early New Bern History, Historic Architecture of New Bern, Civil War and History of Education in New Bern. The Museum is open Monday through Saturday from 1:00pm until 4:00pm and admission is $2 for adults and $1 for students. 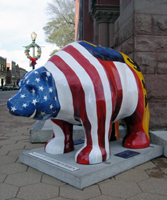 Bears are making tracks all over New Bern…decorated, fiberglass bears that is! Adored with hats, flags, flowers and other unusual and creative features, you will be delighted with each bear’s unique design. To coincide with New Bern’s 300th Anniversary Celebration in 2010, Bear Town Bears, a nonprofit organization, recruited local artists to implement hand-painted designs on life-size standing and walking fiberglass bears for public enjoyment during the entire year. Sponsors for the bears have placed their bears in historic downtown, as well as in outlying areas. The public is invited to enjoy their own “Bear Tracks Hunt” by picking up a free map from the New Bern/Craven County Convention & Visitors Center, the New Bern Chamber of Commerce and other supporting businesses. Children can participate by playing the game “Where on the Bear” to find hidden features on each bear using clues listed on the map. Track bears all over New Bern while enjoying the beauty of these public art sculptures in 2010! 408 Hancock Street, New Bern, North Carolina (252) 636-4087. The Firemen’s Museum houses steam pumpers and an extensive collection of early fire-fighting equipment along with rare photographs, Civil War relics, and even the mounted head of a faithful old fire-horse named Fred, who died while answering an alarm. 141 East Fisher Avenue, New Bern, North Carolina (252) 638-5628. The Croatan National Forest was one site of a battle that was fought in New Bern during the Civil War. Outdoor recreation opportunities include camping, picnicking, hiking, hunting, and fishing. The Croatan Forest has been nationally recognized for its trails and recreation opportunities. National Avenue, New Bern, North Carolina (252) 637-2912. The graves of brave soldiers who fought and died for our country make up the National Cemetery found in historic New Bern. The Havelock Tourist Center, a multi-purpose meeting facility that can accommodate up to 600, features an aviation exhibit that highlights Marine Corps aviation in Eastern North Carolina. Four aircraft on loan from the United States Marine Corps and Department of the Navy will be on display, along with several static exhibits featuring local aviation “aces.” The Havelock Tourist Center Complex includes a waterfront park along Slocum Creek featuring a nature boardwalk and boat ramp. 421 South Front Street, New Bern, North Carolina (252) 633-0043. Fresh local produce is available in the historic New Bern Farmer’s Market. Also a location for community gatherings and events. Can be rented for special occasions. 252-675-5360, New Bern, NC. Enjoy a daytime tour of New Bern’s downtown historic district or chose a romantic evening drive through this beautiful coastal town all while relaxing in a horse drawn carriage. Daytime tours begin and end at the corner of Eden and Pollock Streets directly in front of Tryon Palace Parking Area. Evening tours begin and end on Middle Street near Bear Plaza. (Walking Tour) - Downtown New Bern, (252) 571-4766. New Bern is rich in history and heritage. Let the Ghosts of New Bern share some of the old city’s mysteries, myths and legends with you on an entertaining one-hour walking tour through the streets of the Historic District. Explore why New Bern is host to many unexplained happenings and unsolved mysteries. Do ghosts really haunt some of the city’s buildings and walk its streets? You be the judge! Tours start next door to Morgan’s Tavern & Grill (235 Craven St.). Check our website www.ghostsofnewbern.com for tour schedule, pricing, and special offers and events. Kale Storage Road, Unit 1, (252) 514-2242. Helicopter tours depart from Coastal Carolina Regional Airport or from CCH's helipad area off the approach end of Runway 32. While enjoying the fun of flying in the helicopter, you can see an aerial view of the Trent River, Neuse River, Historic Downtown New Bern from a distance and the area surrounding the Coastal Carolina Regional Airport. Other tours in the New Bern area include a tour of Historic Downtown New Bern, Neuse River North Island Tour, Trent River West Tour, Neuse River South Tour, Neuse River East Tour or you can create a custom helicopter tour. Ticket prices vary with each specific tour. New Bern Grand Marina, (252) 349-3819. Enjoy a tug boat cruise along the beautiful Neuse and Trent Rivers. All cruises depart from the New Bern Grand Marina at the Hilton New Bern/Riverfront Hotel. Cruises are 2 hours in length for up to 6 passengers and $20 per person. Private charters, custom cruises and water taxi services are also available.